To deliver a truly game-changing sports yacht, Princess has teamed up with the world’s finest design and technology partners to ensure the R35 delivers a new, intoxicating experience. It will enthral Princess loyalists and engage new customers at first sight and first ride. The inspiration for the R35 came from many sources, but focussed on one clear goal: how could Princess deliver a beautiful and elegant yacht that re-defines dynamic performance? The result is the ingenious Princess Active Foil System (AFS). Twin moving foils beneath the waterline provide improved dynamic stability, raise the performance bar and increase efficiency. AFS does not elevate the hull above the waterline like the America’s Cup sailing yachts. Instead, it uses the lift to dynamically adjust the heel and running angle, optimising ride and comfort. Incorporated in a small, dynamic sports yacht like the R35, the benefits of AFS are immediately and dramatically obvious. Princess found further inspiration working together with iconic styling house Pininfarina, responsible for some of the world’s most beautiful motor cars. There is a historic and intrinsic link between boat and car design that the Italian company inherently understands – the step changes in automotive design in the 1930s and 50s was inspired by the sweeping curves and graceful lines of the boats of that period. As a result, the R35 looks sculpted, elegant, dramatic, and as breathtaking at speed as it does at a standstill. A testament to the designers who created it. and presenting new technologies and design language that will be rolled out across the range in coming years. techniques have driven America’s Cup racing boats to reach incredible speeds. It has put the world’s oldest sporting trophy back in the global spotlight and illuminated just what is possible onwater. long-held motor racing principle is now happening on water. future yachts. The result on the R35 is a new performance benchmark defined by hydrodynamic innovation via the unique Princess Active Foil System (AFS). Paul MacKenzie, Product Development Director at Princess Yachts. 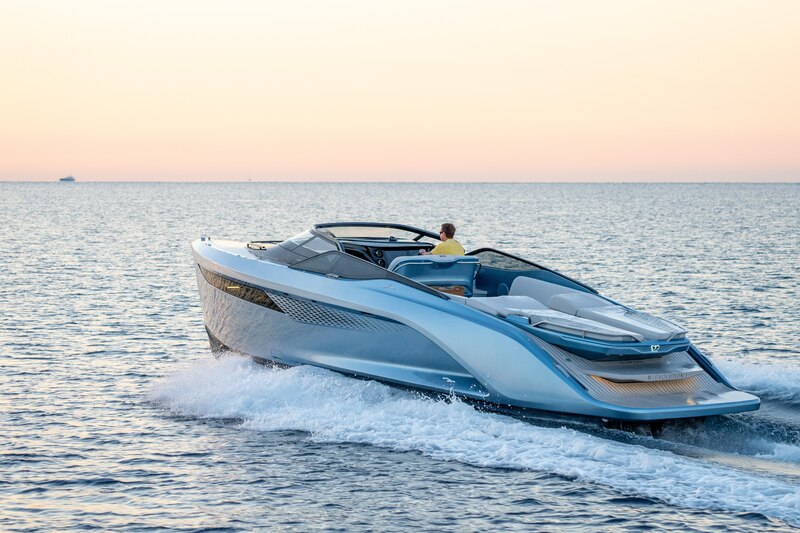 Hydrodynamics are the new fast forward in yachting, and the America’s Cup technology encapsulated in the Princess Active Foil System (AFS) underpins the R35’s fluid, fast and unflappable behaviour across the water: the catalyst for a leap forward in boat design. beneath the waterline to reduce drag and provide unrivalled stability – it also helps the R35 achieve fuel efficiency savings of almost 30 per cent at cruising speed. A mode selector at the helm allows the pilot to choose between Optimal, Sport and Rough weather control algorithms which adjust the attitude and responsiveness of the foils to suit the pilot’s wishes. The R35 has a raft of technologically advanced features that seamlessly combine high performance and comfort. Auto-comfort and auto-sport settings take the strain out of piloting the boat, while independent roll and pitch control can be adjusted manually or automatically, depending on the helmsman’s choice. an exhilarating G-force-induced heave never before experienced in sports yachts. Core to the effective installation of the AFS system was a rigid, predictable and lightweight hull. A full carbon fibre monocoque structure was the only option to fully optimise the potential for Princess’s revolutionary R35 design: the first time this has been seen in a Princess, and any series boat of this size and price point. a resin film infusion, rather than resin infusion, which allows for much more efficient use of resin and a subsequent weight saving of 25 per cent over glass fibre. 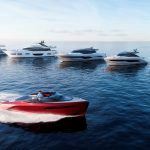 luxury yacht manufacturer to introduce full carbon fibre boat construction on a volume assembly line. the engines provide a tangible boost in performance and excitement: another indication of Princess’s ambition to challenge perceptions at every turn. Kiran Haslam, Director of Marketing at Princess Yachts. Based in Turin, the car design capital of Italy, the Italian coachbuilder has been responsible for shaping some of the world’s most exceptional cars for almost 90 years, including nearly every Ferrari ever created. Theirs is a long-established name forever synonymous with automotive classics, but Pininfarina has also put its considerable talents into designing products as varied as private jets, hydrogen powered supercars, locomotives and even the 2006 Olympic torch. the complexity that goes into defining a new innovative product that needs to be instantly recognisable to the cognoscenti yet stand apart visually from the competition. As a result, more than 100 concept drawings were created by Pininfarina and the Princess Design Studio before a final theme was selected. of a thoroughbred and clearly communicates its performance potential through its beautiful surfacing, functional air passages and strong, defining character lines. Andy Lawrence, Head of Design at Princess Yachts. Form and function unite in the R35’s carbon fibre hull, which has been sculpted out on both sides with Princess’s side air blade design. This adds visual drama and manages air flow and vortices to direct and supress spray that could normally come back into the boat. Computational Fluid Dynamics (CFD) analysis was key to channelling airflow: CFD uses supercomputers to provide detailed analytics of fluid flow to solve design problems and is a mainstay of supercar aerodynamic engineering. And to create the R35’s symphony of curves and edges, extensive development of the lightweight, carbon-fibre hull required 3D modelling software to study the clarity, movement of light and reflections across all the R35’s surfaces. This was especially important as the hull and deck are painted in highly reflective metallic colours. The R35 adds new meaning to Princess’ expression ’Experience the Exceptional’. 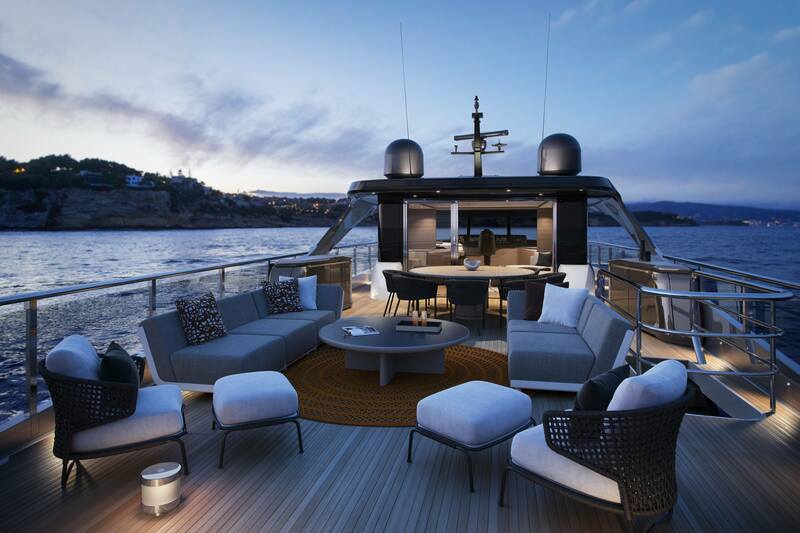 And with the exceptional performance delivered via the new AFS and carbon innovation, the cabin reflects Princess’s expectation that owners and occupants will have an increased desire to stay aboard and therefore delivers the most luxurious of surroundings. feeling of space. A wet-room and lavatory allow comfortable days at sea, while the U-shaped seating surrounding a dining table easily converts into a double bed where integrated blinds ensure a good night’s sleep. The R35 features a convenient hot and cold shower facility on the aft swim platform too: the perfect place to refresh after a day in the sea. Slightly aft, the practical galley kitchen features a sink, drawers and storage space. Guests can relax in front of a 32-inch LED television*, complete with Blu-ray CD/DVD player* that integrates with the Naim audio system. An ingenious forward-facing camera* on the bow delivers live footage to the forward screen, allowing guests to see where they are travelling from every angle. Sarah Verey, Director of Creative Design at Princess Yachts. But owning an R35 isn’t just about having a yacht – it’s about being part of the Princess family. Princess Lifeline provides owners with 24/7 international access to medical and security assistance, or technical help from our global network of dealers. Whatever happens, owners are covered wherever they cruise for the first two years of ownership after which they can easily renew.